The German advance continues down west coast of France. Pierre Laval is appointed as Vice-Premier, while de Gaulle is cashiered by Weygand for announcing the formation of French National Committee in London. First British commando raid on France is made at Le Touquet. Hitler makes a brief sightseeing visit to Paris. Driving through nearly empty streets, he makes a special point of viewing Napoleon’s tomb, ending his tour at the Eiffel tower. US Under-Secretary of State, backs Churchill’s aid-for-Russia policy. The Red Army launches an armored counter-attack near Tilsit in Lithuania, but this is repulsed with heavy losses. German forces cross the River Bug, bypassing Brest-Litovsk from the North and South and penetrating 50 miles into Russian occupied Poland. Slovakia declares war on the Soviet Union. The Russians withdraw to the South side of Sevastopol’s bay, preserving their front, as the bombardment and German attacks increase. German advanced elements reach the Egyptian border. Rommel signals Kesselring for permission to continue the advance in to Egypt, pointing out that at Tobruk his forces has captured large quantities of fuel and supplies. A coal strike is Appalachia is finally settled. President Roosevelt warns the miners that if they strike again, he will draft them into the army so that they will be forced to work. Eden tells the Commons ‘ the facts’ about the killing of 50 ‘escaping’ RAF officers at Stalag Luft III, saying ‘These prisoners of war were murdered’. Generaloberst Dietl, C-in-C of 20th Gebirgs Army on the Arctic front in northern Finland, is killed in an air crash. In one of the largest air strikes of the war, the U.S. Fifteenth Air Force sends 761 bombers against the oil refineries at Ploesti, Romania. The San Francisco Conference Co-ordination Committee, completes the text of the UN Charter. The German advance continues down west coast of France. Pierre Laval is appointed as Vice-Premier, while de Gaulle is cashiered by Weygand for announcing the formation of French National Committee in London. First British commando raid on France is made at Le Touquet. 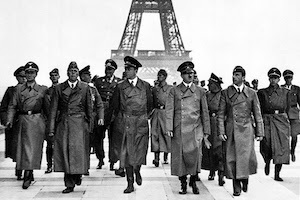 Hitler makes a brief sightseeing visit to Paris. Driving through nearly empty streets, he makes a special point of viewing Napoleon’s tomb, ending his tour at the Eiffel tower.